Add rice, coconut milk, water, salt, shredded coconut. Stir and set over high heat. Bring to low boil. Immediately reduce heat to low (around #2 on your dial) and cover tightly with lid. 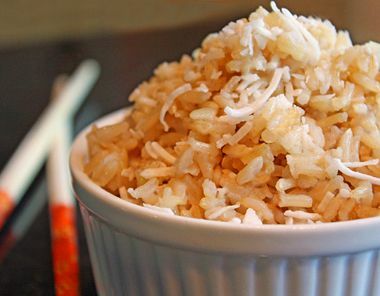 Allow to cook 1 hour, or until coconut-water has been absorbed by rice. Place desired amount of dry shredded coconut in frying pan over med-high heat and stir ("dry fry") until light golden brown.